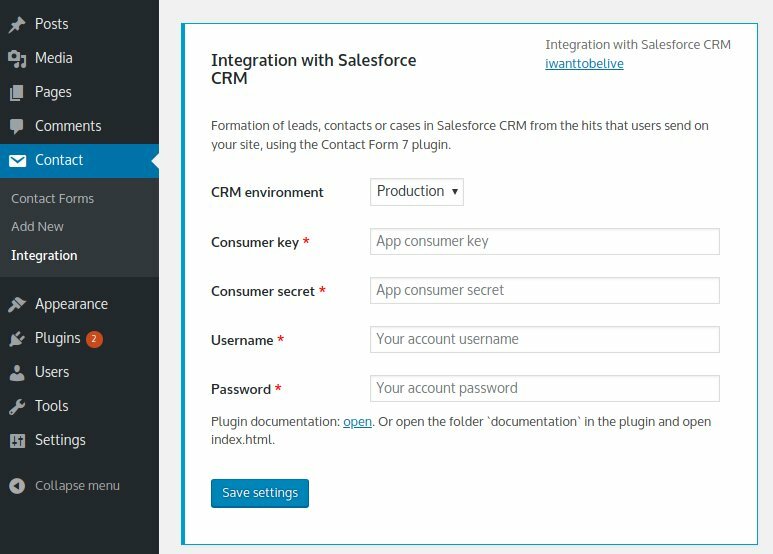 Contact Form 7 Salesforce CRM Integration is a Salesforce CRM integration plugin for WordPress that makes it really simple to send your Contact Form 7 forms directly to your Salesforce CRM account. After the integration, submited the form are automatically added as lead, contact or case to the specified account in Salesforce CRM, together with additional data. Integrate your Contact Form 7 forms with Salesforce CRM. You can choice that your want to generate – lead, case or contact. Fields are loaded from the CRM (including custom fields). Supports for `utm` params in `URL` to use. Support the choice of environment `Production` or `Sandbox`. It can also work with the following editions if access to the API is purchased and the API is enabled. These editions do not have a default built-in API access so it is purchased separately. Fixed: save utm tags - cookies. Feature: choice of environment `Production` or `Sandbox`. Feature: Support for `utm` params in `URL` to use. Fixed: Check whether plugin `Contact Form 7` is active on the `Network`.